In order to process ePayments in Jackrabbit you must have a gateway and merchant account with one of our Payment Partners. If you are not set up for ePayments, you will receive an error message when you attempt to submit the transaction that states you have not activated this feature. 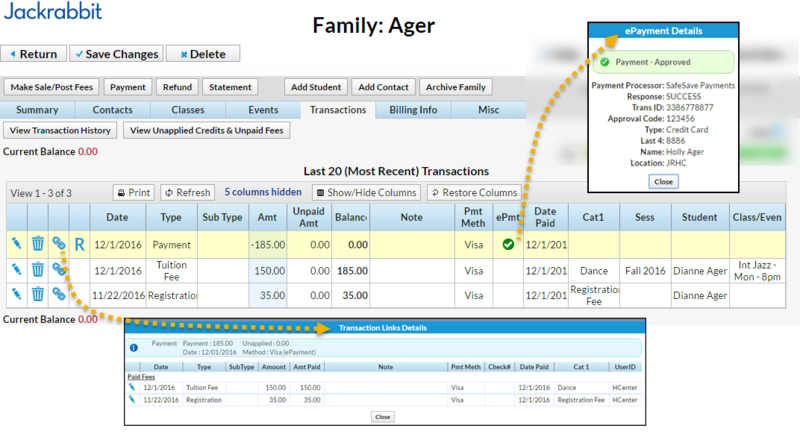 See Get Set Up for ePayments for details on contacting a Payment Partner and setting up ePayments functionality. Family has a credit card saved and has ePayment Method set to Credit Card on their Billing Info tab. They'd like to use this card to pay their entire balance of $185. Method: This field will auto-update based on the first digit of the card number saved to family's Billing Info tab. It is not necessary to change it. In the Post ePayment box, click Submit ePayment. The Approved Message displays, click Ok. The Transactions tab properly reflects a Visa payment of $185 and the payment is linked to fees. For more information on posting ePayments see Use ePayments in Jackrabbit.